If inflammation always bothers you, why not add anti-inflammatory foods to your diet? Here are 6 easy anti-inflammation recipes that will really work. Diabetes, arthritis, heart disease, Alzheimer's, and allergies are all common health problems that have something in common: inflammation. Inflammation is either a cause or an instigator of all of these diseases and it all starts with the foods that you eat daily. So why not add some nutritious foods that can fight inflammation to our diet? Here we pick top 6 anti-inflammatory recipes from nutritionists' books and also some popular recipe blogs. 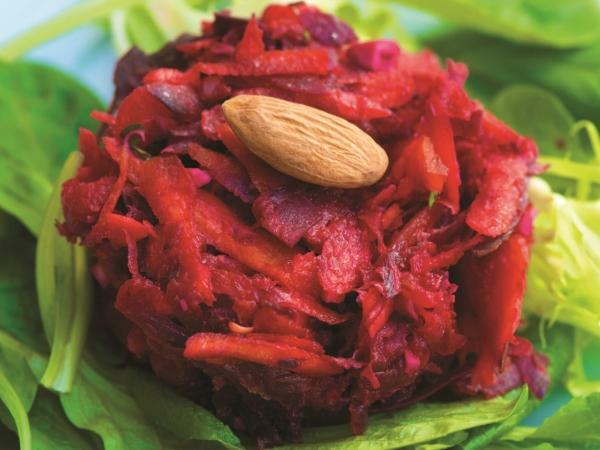 Beets have great antioxidant properties which give them brilliant red color. Because of high content of vitamin C, plant pigments called betalains and fiber, beets have been shown to fight inflammation and lower the risk of heart disease and cancer. Besides, beets are also rich in butane which can help you digest foods. 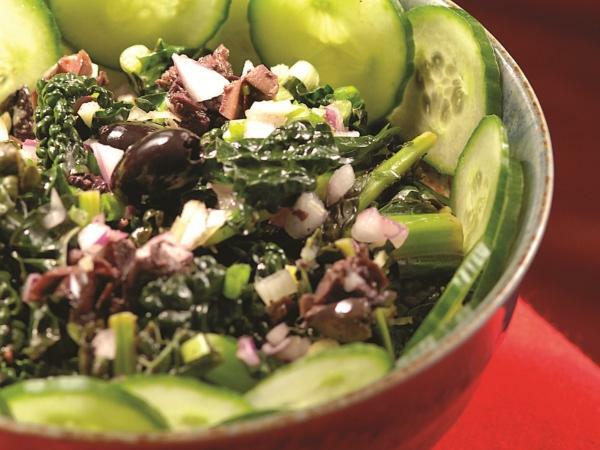 Toss all of the ingredients together in a large bowl, except for the mixed greens. Add the optional ingredients if using. Divide the greens onto 4 plates and top it off with the beet and the mixture. Kale is known as "the queen of the greens", "the new beef" and "the nutritional powerhouse". There are many benefits of adding kale to your diet. It is low in calorie, but high in fiber. Its fat content is zero. Besides iron, vitamin K and antioxidants, kale is also high in omega-3 fatty acids, which can help fight against autoimmune disorders, asthma and arthritis, making this one of the best anti-inflammatory recipes. Wash the kale and then cut it into small strips. Steam the kale lightly for 5-7 minutes in a steamer basket. Mix the kale with lemon, basil, salt, and oil in a large bowl. Then toss. 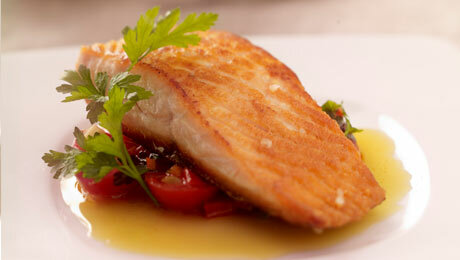 Salmon's amazing omega-3 benefits have been known for many years. But the recent studies found that salmon also contains bioactive peptides which may provide support for joint cartilage, effectiveness of insulin and may help control inflammation in the digestive tracts. So, to be healthy enough, why not eat more salmon? 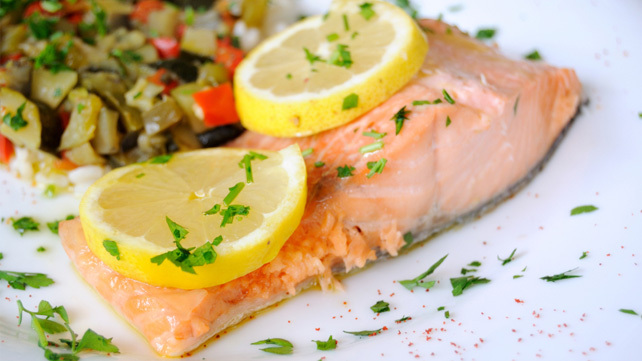 Toss the salmon fillets with lemon juice, olive oil, salt, and pepper in a shallow bowl. Let them rest for 15 minutes. Cook the salmon in a nonstick skillet, skin-side down, over medium-high heat for 2-3 minutes. Shake the pan or use a spatula to keep the fish from sticking. Reduce the heat to medium and cover the pan. Cook until the salmon is cooked through, about 3-4 minutes more. The skin of salmon will be crispy and the meat will be medium rare. Combine the arugula, onion and tomatoes in a bowl. Before serving, add salt, pepper, oil and vinegar. Then toss well. Place the onion, lemon, zucchini, white wine and water in the bottom of a Dutch oven. Season the fish evenly with pepper and salt. Fit a greased steamer rack over the veggies in the Dutch oven and make the liquid to boil over medium-high heat. Reduce heat to medium-low and place fish on the rack. Cover and steam until cooked through, about 8-10 minutes. Serve fish on top of veggies and liquid and top with olives. Looking for some great anti-inflammatory recipes? Here is the one. Stuffed peppers is a classic in 1950s, but quinoa and turkey stuffed peppers gives it a modern definition. This recipe use quinoa which is one of powerful superfoods in the world instead of stuffing with bread. 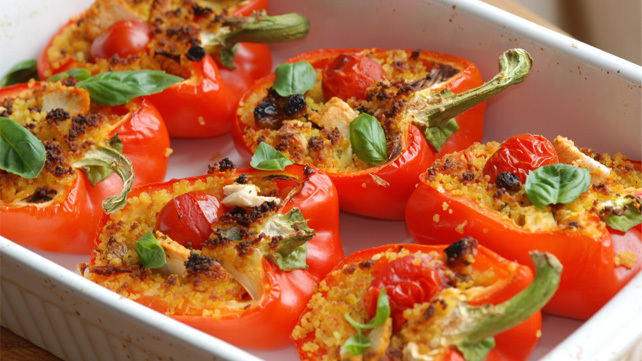 Choose yellow, red or orange peppers for a sweet taste. Stir together quinoa, water and salt in a saucepan. Bring to a boil over high heat. Then reduce to low heat, cover and simmer for 15 minutes or until the water is completely absorbed. Uncover and let it rest for 5 minutes. Stir in the sausage, chicken stock, oil, pecans, parsley, and rosemary. Cut the peppers in half and scoop out the membranes and seeds. Cook in boiling water for 5 minutes, then drain. Fill the peppers with the quinoa mixture. Place in a lightly greased baking dish and bake for 15 minutes at 350˚F. Ginger is one of the most powerful anti-inflammatory foods in the world. Some studies show that the anti-inflammatory property is even more powerful than drugs. 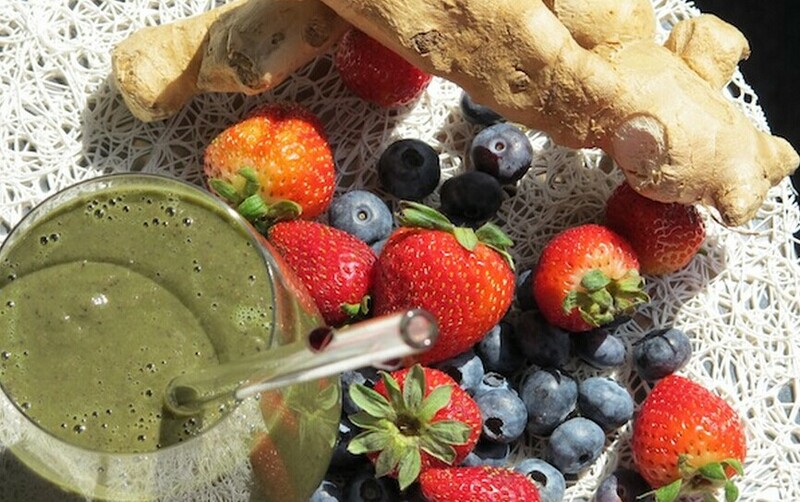 So let’s learn how to make a smoothie with the powerful ginger! Place all ingredients in a blender. Then blend for 1 minute, or until smooth. Serve immediately or store in an airtight container for less than one day.